Screwdrivers can make installing or removing a fastener easy or extremely difficult. 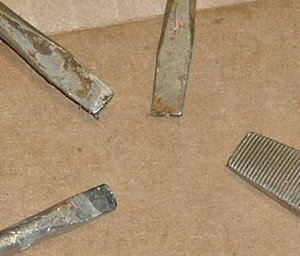 As they are used their tips become worn and less capable of doing the job they were intended to do, resulting in skinned knuckles or buggered screw slots in the fasteners. Like any other tool, screwdrivers need to be maintained. Three of these screwdriver blades are way past their prime, so they need work. Can you guess which is the good blade? We've covered (it's in the archives!) how to select the proper screwdriver for the job, but what if your screwdrivers are hand-me-downs, well-used or otherwise not up to the task? 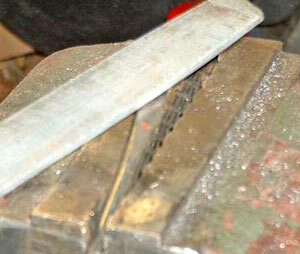 Before throwing one away and buying new, why not re-shape and re-sharpen the blade? 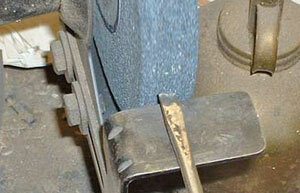 All you need is a grinding wheel and a file, so let's turn on the workshop lights and get to work! For purposes of this article, we're going to concentrate on flat-bladed screwdrivers. Phillips screwdrivers wear out too, but less frequently. They are somewhat harder to renew, so we'll save that task for later. Notice in the photo that the blade on our screwdrivers are blunted and rounded, making it easy to slip out of a screw slot. The fresh blade in the photo shows us how it's supposed to look. Don't go any further if you think this is the wrong angle. The first thing we need to do is grind the end of the screwdriver to get rid of any nicks and imperfections, and it will become obvious that each time you re-sharpen a screwdriver you make it a little bit shorter. Lay the blade against the fine grinder wheel. This is easy to do as long as the original taper of the blade is maintained, so take some time to align the blade to the grinding wheel to duplicated the angle. Gently grind away, checking constantly to verify the taper angle isn't being changed. Don't let the blade get too hot (if it glows red, slow down!) and grind both sides. 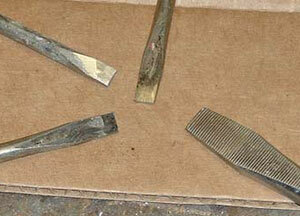 You should be left with a sharp tip and consistent taper. Just hold it to the wheel and make sure everything is square. Now that the tapered shaft is ground to a sharp edge, it's time to create the head. Holding the edge perpendicular to the grinding stone, push it gently against the stone to grind a flat, dull tip to the blade. Depending upon the size of screwdriver you're working with, the width at the tip should be wide enough to completely fill a screw slot all the way to the bottom. Take your time while grinding to get the tip properly shaped. Now "dress up" the sides of the tip by giving them a quick grind. 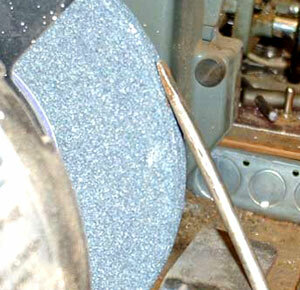 Take a fine file and smooth off all the grinding marks, touching up the tip as needed. Test the blade once more in a screw and start using it! File until everything is smooth and correct. Now the three re-shaped blades look more like the good one!